Appetizers are small bites of food to whet the appetite in anticipation of the larger feast. They also serve as single-serve party foods, which can be eaten without utensils in just one or two bites. Serve your appetizers before a meal or alone for a cocktail party to make your event memorable. Appetizers whet the appetite for the upcoming meal. Fruit and cheese pair well together, especially when served without a meal following. Provide a sampling of three to five cheeses for your guests. Cut firm and semi-firm cheeses into bite sized cubes or small slices and arrange these on the serving tray. Place whole wheels of soft cheeses such as Brie onto the tray with a cheese spreader. Provide crackers to spread soft cheeses onto. Opt for mild-flavored crackers such as rice crackers or water crackers so they do not mask the flavor of the cheese. Slice apples and pears into slender wedges and dip into water with a teaspoon of lemon in it to keep the fruit from browning on the tray. Rinse off red or black seedless grapes and trim larger bunches into clusters small enough to be held in a hand. Arrange the fruit and crackers around the edge of the platter with the cheeses in the center. Have small plates and cheese forks on hand for the guests to serve themselves. A fruit and cheese tray is a classic appetizer. 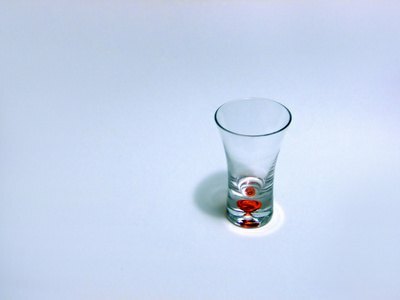 Take a conventional appetizer such as shrimp cocktail and serve individual portions in shot glasses instead of as a communal dish. Fill each shot glass halfway with cocktail sauce and hook a peeled, cold-boiled shrimp with the tail from the rim of the glass. Arrange the glasses on a serving tray and fill in open spaces with parsley to make the tray more attractive to the eye. Other appetizers that can be put into shot glasses include carrots and celery sticks with ranch dressing in the glass or buffalo wings with hot sauce in the glass. Shrink your appetizers by serving them in shot glasses. 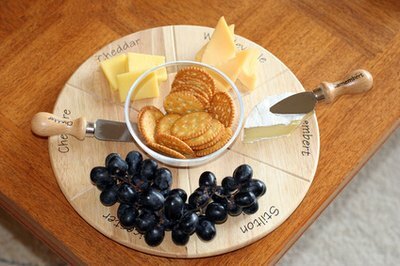 Arrange meats and cheeses cut to fit onto round buttery crackers or saltine crackers on a serving tray. Place the crackers in a row beside the meats. Possibilities for meat and cheese combinations include ham and cheddar, ham and Swiss, turkey and Swiss and roast beef and cheddar. Instead of crackers, serve party toasts with the meats and cheeses for the guests to make their own bite-size sandwiches. You can also make the mini-sandwiches ahead of time and hold them together with toothpicks. 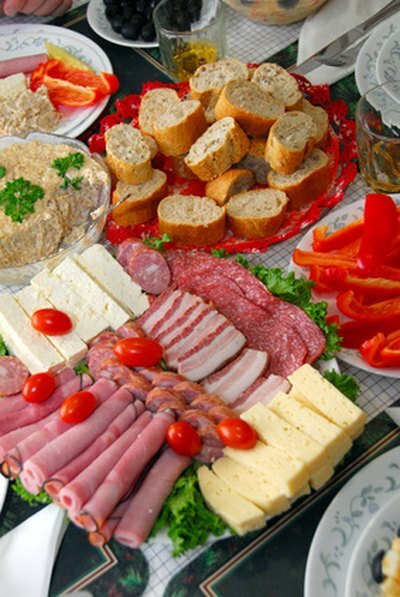 Cold cuts and cheese on a tray allow guests to make their own cracker sandwiches. Many appetizer options can be served on bamboo skewers for ease of serving and a more impressive presentation. Alternate bite-size pieces of fruit or vegetables on skewers and stack them on your appetizer tray next to a container of dip. Skewer cooked meatballs for your appetizer tray for a meat-centered appetizer. 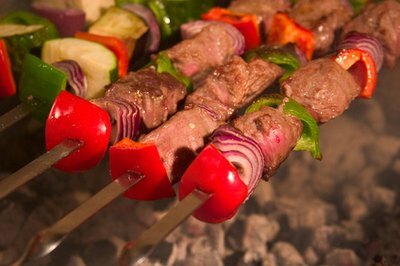 Kabobs with grilled cubes of meat and vegetables are a heartier option for your appetizer platter. Skewered kabobs are a hearty appetizer.